Negotiation is a trained skill. If you haven’t trained, you are leaving money on the table – especially if the other party has some negotiation training and you do not. Don’t worry- you can quickly get up to speed by reading Getting To Yes. This book is a plain-language, practical, bare-bones, and to-the-point guide to negotiation. Roger Fisher is a Professor or Law Emeritus at Harvard Law School and Director Emeritus of the Harvard Negotiation Project, as well as the Founding Chair of the Program on Negotiation at Harvard Law School. He has consulted for governments, corporations, and individuals, and it the author or co-author of numerous prize-winning scholarly and popular books. William Ury is cofounder of Harvard’s Program on Negotiation and Distinguished Fellow of the Harvard Negotiation Project. He has been a consultant for The White House and has served as a mediator and negotiatior in situations ranging from worker strikes to ethnic wars. Roger Fisher – Originator and executive editor of the award-winning TV series The Advocates. William Ury – Has mediated workers strikes and even ethnic wars. Bruce Patton – Helped to create the process that ended apartheid in South Africa. Positional bargaining happens when each side takes a superficial position that is intertwined with their egos. It consists of the taking up and giving up of positions, such as “that’s crazy, that’s not realistic, or that’s not serious.” Positional bargaining is little more than a contest of wills. Remember tht negotiators as sensitive human beings with different values, backgrounds, emotions, and biases. Interest-based negotiation focuses on the interests of the parties, not superficial positions. A position is a superficial conclusion about the other party, while the interests are what caused you to come to that conclusion. If interests are satisfied in news ways, your conclusion can change. Conflict often leads to new creative solutions. So in a way, conflict (in business) is good. You can tell the difference between a position and an interest because often positions are like big billboards – they are loud and attention-grabbing. Interests, on the other hand, can be unexpressed and hard to put your finger on. One of the best ways to discover and identify the interests behind a position is to ask the other party why they said or believe something. Ask them how they came to that conclusion. The most powerful interests are basic human needs: security, economic well-being, a sense of belonging, recognition, and control over one’s life. ATTENTION FREELANCERS: Hands down, this is one of the best books on negotiation we have read because it is so practical, concise, and effective. 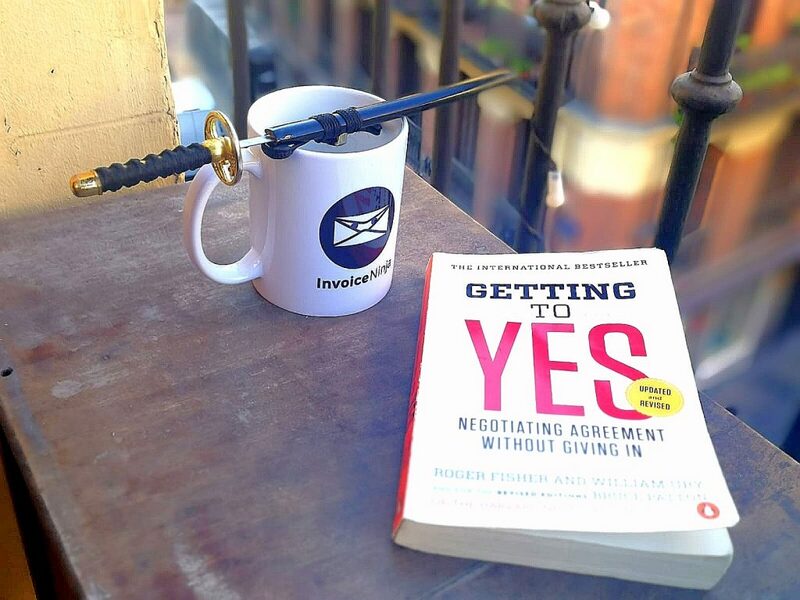 You will get more from your negotiations if you read this book! A must-have for Invoice Ninjas.